For the project three IBM Series x3650 M4 servers have been provided. Two with large (256GB) amounts of memory, one with 16GB. The latter we will use for storage. Each physical server has two Emulex OneConnect OCe10102 10GbE network cards. We will use this plus an Intel 1Gb NIC to host our iSCSI LUNs. The other Emulex 10GbE card we will use for NFS. The storage server has two 146GB and three 2TB SAS disks. This will enable us to use the first two disks for the OS and the other three for data storage. 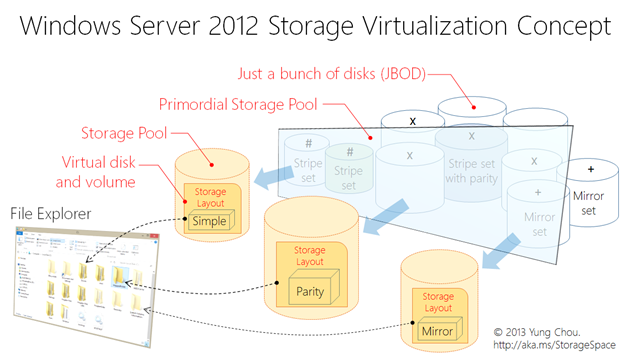 Again to keep costs down, we have decided to utilise Windows Server 2012 R2 as the storage OS. It is well supported in the business and provides and excellent platform for both iSCSI and NFS. $content = "sel disk 1.`nclean.`ncreate part pri.`nformat FS=NTFS quick.`nactive.`nend." More information can be found on Yung Chou’s blog here. Format-Volume -DriveLetter E -FileSystem NTFS -NewFileSystemLabel "Datastore01"
New-FsrmFileGroup -Name "Only ISO-ZIP" –IncludePattern @("*.iso", "*.zip") –ExcludePattern "*. *"
New-FsrmFileScreen -Path "E:\nfsroot\NFS" -Description "Only ISO and ZIP allowed" –IncludeGroup "Only ISO-ZIP"
The configuration of the lab storage is now complete. In part 3 we configure the physical networking to host our deployment. "Only ISO-ZIP" –IncludePattern @("*.iso", "*zip") –ExcludePattern "*. *"
Love this series, even if I am 6 months behind the times! Question about the above line. Is the *zip intentional or was *.zip intended?